Acidity occurs when you have acid seems in stomach, here is home remedies of acidity, acidity's ayurvedic upay. When this discharge is increase then we feel that our chest is burning. Mostly it is happens when we eat spicy food. Let us know home remedies for acidity. Do not drink too much coffer. You can drink herbal tea instead of coffee. Drink lukewarm water every day. You should include banana, watermelon and cucumber in your diet. If you have acidity problem then you should drink coconut water. Make a habit of eating your meal before 2-3 hours of taking sleep. Acidity occurs only when you keep more gaps between your meals. Therefore, you have to eat in little time. Avoid eating spicy food, ketchup (chutney), pickles and vinegar. Boil mint in water and drink it after your meal. You can get relief in acidity by eating jaggery, lemon, banana, almond and curd. 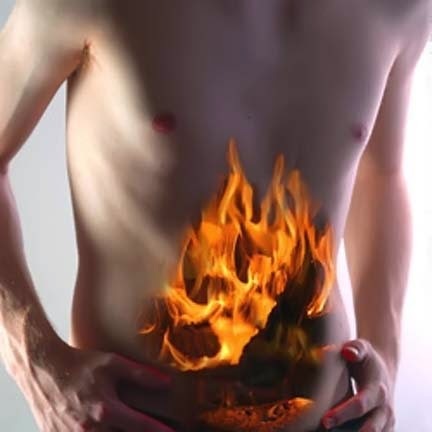 Acidity occurs due to heavy smoking and drinking too much alcohol. You can chew chewing gum. It makes saliva in your mouth and food can be easily digested. Ginger is very good for digestion. You can intake ginger powder or capsule or you can include it in your diet. Drink mixture of lemon, sugar and water before taking lunch. It will give you benefits. You can include horseradish, beans, pumpkin, cabbage, onions and carrots in your diet. Drink pineapple juice. It is full of enzymes. If you feel that your stomach is heavy or full after taking meal then you have to drink half glass of pineapple juice. It will remove anxiety and acidity.